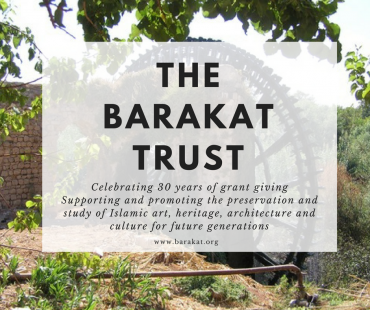 The Barakat Trust’s Grant applications for 2018 opened on 3 January 2018 and closes on 31 March 2018. Applicants will be informed of a decision shortly after the end of April 2018. One scholarship of £15,000 to a Muslim student from the Islamic world who has already been accepted on one of the following taught Masters courses. Where a student has been accepted on a two-year course, the grant may be awarded or renewed for the second year of the course, on the condition that the student is able to demonstrate outstanding performance during the first year of the course. Established scholars attached to research institutions, including but not restricted to universities, museums and libraries, may apply for awards with an upper limit of £10,000 each for research, educational and/or training programmes, and other projects relating to the archaeology, the conservation and the history of the material and visual culture of Muslim societies. One or more awards of £18,000 each to enable a Muslim post-doctoral scholar, who was awarded a doctorate after 30 June2012, to spend nine months (normally October to June) in Oxford to carry out a specific programme of research or to prepare such research for publication. Please see the separate guidelines to this grant.